Advent Wreath at Kenrick-Glennon Seminary, in Shrewsbury, Missouri. This large wreath is in the seminary's lobby. 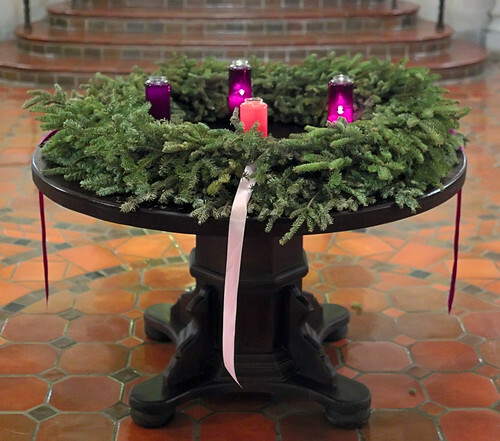 Advent wreaths are originally a German custom; in that country, all four candles are typically red instead of using the Catholic Advent liturgical colors of purple and rose as seen here. Interesting about the different color for German. The sisters at our nearby convent always sing Stille Nacht (Silent Night) in German at Midnight Mass it is quite moving. I will have to look at their Advent Wreath more closely this year to see which they use! I saw a photo of Pope Benedict with his own Advent wreath - it had red candles. In Spain we use always a white candle, a red candle, a green candle and a purple candle.